I told my friend that since I retired I had been doing a bit of writing about the Daytona and Sebring races we both worked during the late ’60s and early ’70s. I mentioned that I had several stories published in Sports Car Digest and my story about the 1970 Daytona 24-Hour race was recently published in Panorama which is the in-house membership magazine for Porsche Club of America. 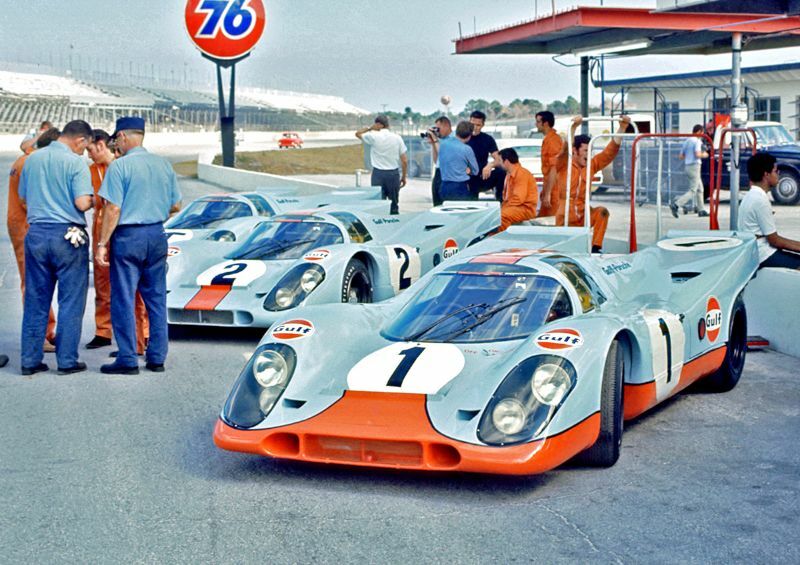 1969?” I told him I was aware that John Wyer tested some new Gulf Porsche 917s at Daytona about that time but I had heard of nothing futuristic. Sometime in early November of 1969 I got a call from “Penny” Pennington Chief of Flags for Central Florida Region/SCCA. He said that the Daytona track had been rented by Porsche for some testing prior to the Daytona 24 in late January and needed a handful of corner workers for the infield course. They were going to pay workers $50 a day, which was $50 more than we ever got working SCCA sanctioned events. I jumped at the chance to do this mainly because I loved Porsche race cars. I didn’t tell Penny that I would have worked for free, I just wanted to be there. I arrived early on the scheduled first day of testing and went immediately to the garage area where I came across the John Wyer Gulf team of Porsche 917s all decked out in orange and blue Gulf Oil livery. To my surprise there was another Porsche team there that I had not heard of before and they also were testing a Porsche 917. The car was painted red and white and had the word “Austria” painted in big letters on the front of the car. During the first couple of days of testing things went well for all the cars with the new Kurzheck (short tail) bodies providing plenty of down force on the 31 degree NASCAR high banks and lap time records were being broken almost every day. I heard from some of the Porsche mechanics that speeds on the high banks were over 353 kilometers per hour. Remembering my old Army conversion tables I quickly estimated that meant over 220 mph. When I was in the Army and stationed in Germany in the ’60s I picked up enough German to converse with the Porsche mechanics at Daytona and made friends with a fellow I call Fritz. He was one of the mechanics for the Porsche Austria team. After practice one day I took Fritz and showed him around Daytona, the beach scene and other attractions. He was amazed that we could actually drive on the beach and after the 50-cent tour of Daytona we went for dinner at the San Remo Restaurant in South Daytona. The place was run by the Levetto family and they were well known in the racing community and the sons, Mario and Guido, had raced in the Daytona 24-Hour several times. I did as directed and early the next morning parked myself near the Porsche garages. The garage doors were down but you could hear people inside all the garages getting cars ready for the last day of testing. As if on cue at exactly 9 a.m. one of the garage doors came up and a red and white Porsche Austria 917 began to come through the door. However it was not the car we had seen in testing but a duplicate 917 with a large letter “T” painted on the side and “XP” in smaller letters painted next to the “T”. As more of the car came through the garage door we noticed it was being rolled out on a low wooden dolly and the car had no wheels or tires or an opening for them. Mechanics were pushing the car toward their place on pit road and when my friend Fritz saw me he waved, nodded toward the car he was pushing and winked. We followed the car and the mechanics toward pit road and only then did I notice that there were several men in white lab coats following this entourage and wheeling along several pieces of electronic-looking machinery. Once on pit road and in front of their pit box the mechanics stopped pushing and locked the dolly wheels in place and stepped back from the car. Almost immediately the men in white lab coats stepped in and opened up the back cover of the car to expose the engine bay. When the cover went up you could almost hear an audible gasp from the small assembly of Speedway officials and onlookers who were there that chilly November morning. There was no engine in the engine bay. All that we could see was what looked like an irregular black box about half the size of a normal Porsche engine. Protruding from it were several wiring harnesses that went to the tubular frame at the rear of the car and into smaller black boxes. The larger black box had a fair-sized Porsche logo on top of it. For some reason it got deathly quiet as we watched the men in the white lab coats plug in their machines to a place on the right side of the larger black box sitting where an internal combustion engine would normally reside. If it wasn’t so quiet we would have certainly missed the humming sound that started up from the engine bay and increased in pitch. Then, like something out of a science fiction movie, the race car began to lift off of the dolly by no more than a couple of inches. The mechanics then stepped in, unlocked the dolly wheels and pulled the dolly from underneath the car leaving it hovering above the oil-stained concrete with nothing supporting it. Years later when I saw the movie Star Wars the scene with the landspeeder reminded me of what I had witnessed at Daytona in November of 1969. I think George Lucas must have known about this Porsche and that gave him his inspiration for the landspeeder. As we stood there gawking in amazement into this scene stepped British driver, Vic Elford, with driving suit on and helmet in hand. The lab coated fellows lowered the engine bay hood and someone shouted that all corner workers must get to their posts for testing was about to commence. Great read. I have heard rumors of this test over the years but not seen anything from one who was actually there. Lets get together and see if we can talk Porsche into bringing this 917 west for the 2014 Rennsport at Laguna Seca. What an UNBELIEVABLE story! Well done Lou. Saw this testing at Mosport many years ago, what a trip. If I remember correctly Canadian firm Avro claimed that their protected intelledtual property had been compromised, but in the end it was the fuel and tire sponsors who conspired to kill the “Star Wars” Porsche. APRIL FOOL’s yarn well spun by Nigel Smuckatelli!! You should have told the truth , Lou ! Not “Important people from the oil industry, car industry and several governments pressured and then paid off Porsche ……..”; it was Firestone, Pirelli, Goodyear, etc. that were REALLY upset ! Dang! I was there for the race and all practice/qualifying days but I missed the test session. I’d probably have left the camera in the car anyway. I’m thrilled to be able to provide photos of the driver and brains behind the mystery car as well as the opposition. Oops. I see that I’m two days late in posting this. OK, Happy April Fools Day! My Polish cleaning lady says in Poland, Germany, etc that among other things, April 1 is Liar”s Day and anything goes. This was a good yarn, and though I have not been a practicing engineer since the 1970s, I can see too many flaws to believe this story. Of course, levitation is simple to achieve, but precise directional control is difficult, if not impossible in a race track environment. (at least from the appearance of the car, any way). Yes, I know that there are U.S., British and Russian aircraft that have the features to do what the story suggests, but it is doubtful that they can do it within the envelope of the race tracks mentioned. A ripping yarn. Can’t wait to hear next year’s. Thanks for this excellent story and excellent picture of the unique star wars 917 ! I like 1st of April ! Over the years, I’ve heard of things like this happening (always on an April First, for some reason).